This Blog is made to share all info about European Football, AC Milan, The City of Milan, Milanello, Soccer, all the things related to health and athletes. Suffering three defeats from four games, is not the start that AC Milan were writing in their early season script, but just like a series of unfortunate events, that's simply the fate that Rossoneri must endure. After last weekend's defeat against Udinese, this midweek, the Rossoneri already have the chance to redeem their current bad patch, although many problems still clouding their path. AC Milan tasted another defeat but Massimiliano Allegri's future apparently might still alive considering the messy circumstances that hit Il Rossoneri at Friuli stadium. Having two players sent off in the second period simply cost Milan the game, which is already difficult to begin with. Cristian Zapata might reconsider his decision to lunge a tackle the resulted in his dismissal along with a penalty kick, but Kevin Prince Boateng might really need to control his discipline after he also got a marching order 10 minutes from time. Will Friuli Be Allegri's Final Dance? 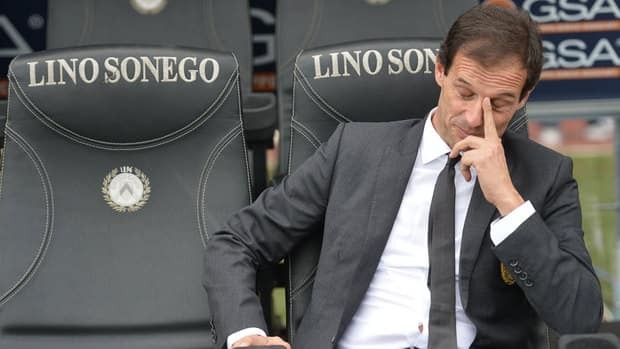 Massimiliano Allegri's faith is hanging in very tight rope at the moment as many Italian press suggested that the upcoming match against Udinese on Sunday, could be the final test for him this season. Although this possibility has been denied by Ac Milan's vice president, Adriano Galliani, but one can't really be sure about Allegri's future, especially after a rather similar situation occurred regarding Zlatan Ibrahimovic and Thiago Silva's departure this summer. Has Expressive Boateng Lose His Swagger? The major overhaul that AC Milan took this summer left many holes to fill, especially that leading role up front which is badly needed after the departure of Zlatan Ibrahimovic, who arguably was Rossoneri's vocal point in attack during his two season at Milanello. Being one of the players who have been improving well in the past couple of seasons, Kevin Prince Boateng, currently attempting to take some of that responsibility, although so far it hasn't been successful. Another disappointing result occurred for Ac Milan this midweek as they still couldn't break their winless home streak in this early part of the season. A 0-0 draw against Belgium champions, Anderlecht, in the magical Champions League night brought massive jeers from the home crowd, who are anxiously waiting to see their side start winning at San Siro. In what some Ac Milan fans considered as one of the club's darkest period, a spark of light still shines this summer, due to the introduction of some young talents on Rossoneri's first team squad. Among several potential names who have been raved by Milanisti, one that has been catching majority of people's affection is Mattia De Sciglio. Milanello Special : Will European Night be Milan's Turning Point? A moment of uncertainties creeping down into the head of Ac Milan players as they walked off from San Siro pitch minutes after suffering another disappointing home defeat in Serie A. The 1-0 loss against Atalanta also marked their worse league start in after 80 years, not in terms of points gained, but much more because of picking up two home defeats already in such an early start. contact guitar_staccato@yahoo.com to advertise with us. dewfunk . Powered by Blogger.